The Urbanaut® is the only elevated technology capable of using multiple types of switches. 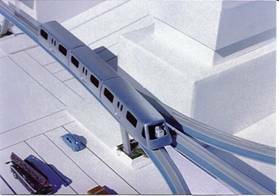 It is also the only monorail system in which it is possible to switch vehicles from a smaller guideway onto a large one. The selection of one of the 4 types of Urbanaut® small simple lightweight switches depends upon application. v An on-board passive or active switch for slow speed, applicable to off-line stations and service areas. v A shuttle switch for "pinched end" stations. Shown is a remote controlled Urbanaut® exiting a single guideway and entering a 3-way switch, where the guiding rail is in position to the right, to receive the 3-car train entering the switch. By remote control, the train can be directed to any of the 3 guideways, from which the train can be returned to the single guideway. Ideal for Figure 8 guideway layouts. 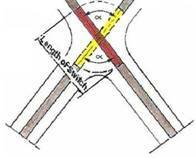 The use of a swivel switch can save millions of dollars where complex elevated bridge crossings or tunnels, such as would be required by light rail and straddle beam monorails, would be necessary. For safety, the switch will have signals and/or gates and railings at surface. A slightly longer swivel switch can also be applied at surface to adapt the crossing for pedestrian and auto traffic with a pathway on each side of the switch. Two redundant safety devices are applied to switching. 2. Emergency brakes will stop the vehicle before entering the switch. Vehicles are guided by automatic on-board vehicle control from main line to off-line stations or maintenance facilities when entering the station, and vice versa when leaving the station or facility. This type of by-pass passive switch can be integrated with a station so one train can be loaded or temporarily "stationed", while another train is moving by. Other applications are intended to enhance distribution of service to larger areas and provide more frequent service. 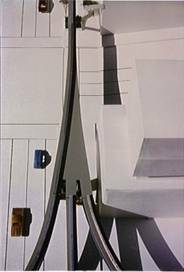 Urbanaut®'s "shuttle switch" transfers vehicles between two parallel guideways for bi-directional travel. A Shuttle switch can be applied where a dual guideway converges into a single guideway at a maintenance facility or at the end of the guideway (a "pinched end"). The vehicle or train is then driven into the facility or shuttled onto the other track for its return trip to the other end of the system. If the switch is located adjacent to or as part of a station, it can be activated while passengers are entering the vehicles/train, thereby saving time in operating the system. See a video of the switch in Urbanaut Technology Center section. An Urbanaut® elevated single or dual line right-of-way loop concept, similar to the one illustrated, can be applied to distribution of people within communities, industry, shopping centers, health facilities, ports, parks, university and school campuses, recreational areas and other sites. Such a guideway concept is expandable and can be connected to other future loops or guideways if needed. During high capacity demands, vehicles (trains) will operate continuously around the loop, programmed for maximum service. 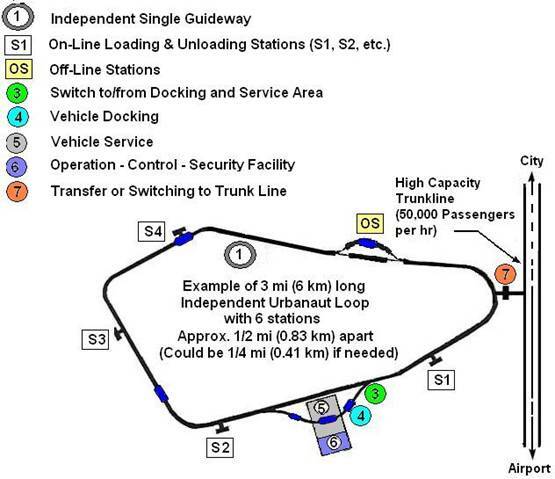 When there are few passengers, such as at night, the excess vehicles can be docked and/or serviced away from the main guideways as illustrated. Such an Urbanaut® system will be fully automated (no drivers) and be controlled from a facility adjacent to the guideway. Security personnel, by means of audio-visual communication, would view the vehicles, inside and out at all times, during unloading and loading, as well as while traveling on the guideway. The Urbanaut® loop concept is based upon statistics which show that an average auto trip length is approximately 8 miles, or within an area of 5 square miles. Urbanaut® switches contribute significantly to the technology, making it expandable, enabling more frequent service, and handling of larger capacities of passengers – essential capabilities to make a system profitable. The Urbanaut®'s central stabilizer (fin) is made into a lightweight high speed switch, which is flexed by automatic operation to route the vehicle under normal speeds from one guide way to another. This allows the Urbanaut to be used in a network configuration so that larger areas in a community can be served and the vehicles can be utilized more efficiently. It is the only monorail in which it is possible to switch vehicles from a smaller guideway onto a larger one. This has application where smaller, independent single guideway Urbanaut® "circulators", exit from a trunk line and extend into a high density community, will interact continuously with passenger movement to and from, avoiding large, expensive parking lots at the stations. In the maintenance facilities, the center guide rail is removed, with free movement of vehicles and no switches are needed. The Urbanaut® vehicle is designed to be perfectly stable when it is off the guide rail. 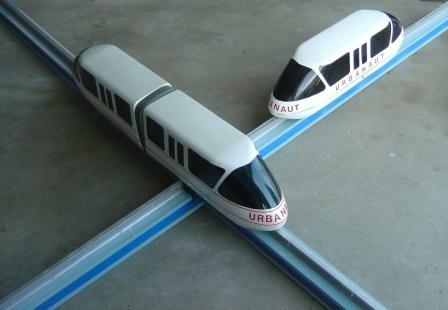 An Urbanaut® maintenance facility may require only 1/10 of the area and cost to build compared to the straddle beam monorails and light rail which require immense platform areas and complicated structures to handle switching the vehicles for maintenance. This is why straddle systems and light rail are generally "line oriented", between two end points – not very versatile in serving sprawling urban areas.